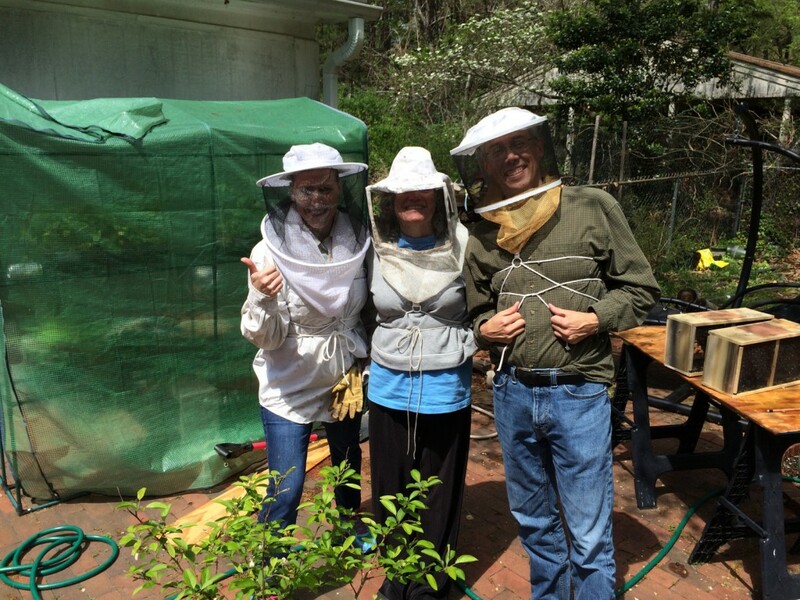 Exciting news, on the weekend we added 2 new hives to our apiary, for a total of 3! (I know what you’re thinking, you thought we already had 2 hives…sadly, we lost one to mites last fall and I haven’t been able to bring myself to write about it yet). 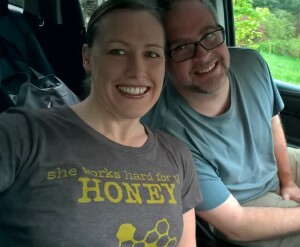 Hitting’ the road to Bailey Bee Supply to pick up our new bees! 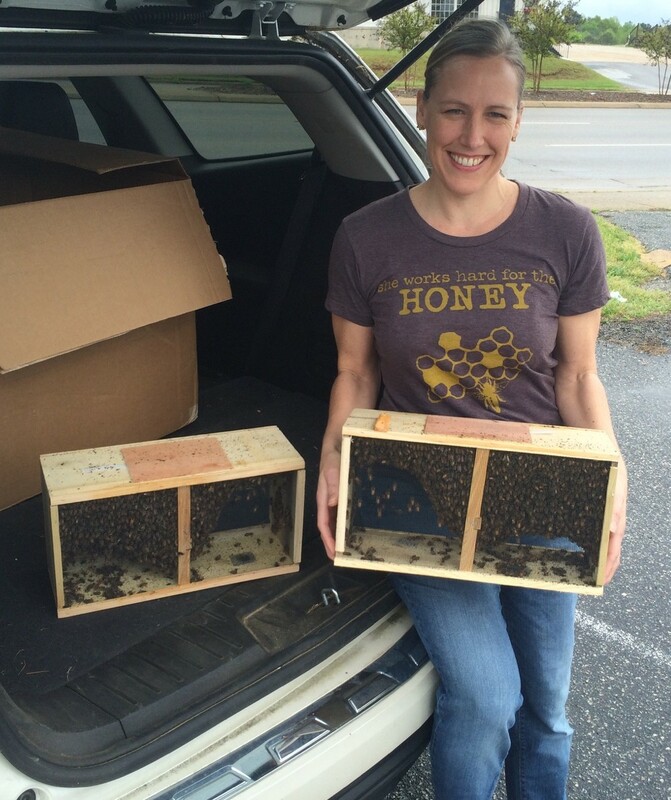 Our 2 “packages” of bees. Close-up: inside the cluster there’s a can of syrup for feed, and a Queen, in her own little cage. This time the Queens that shipped with our package were “marked” with a small dot of white paint on their back. This helps with spotting the Queen during inspections. Here she is in all her beauty! Queen Beelee! Shout out to my niece for picking the name! As with last time, we introduce the Queen slowly, to ensure the worker bees accept her. 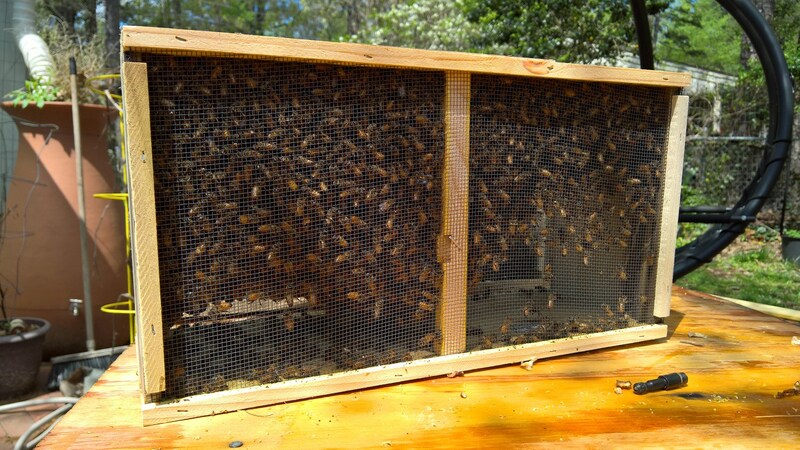 Queens that come with a package have been raised separately until the time that the packages are assembled; 3 lbs of stranger bees are then shaken into the screened box with the included Queen in a cage like the one above. There is an escape hole filled with soft candy that will take the bees a couple days to chew through. By that time they will have experienced the Queen’s signaling pheromones long enough that they will have learned that this is their Queen and the new hive is their home. I have to say, I was so impressed with Bobbi. She loves bees, but being surrounded by a lot of confused flying bees would be enough to unnerve a lot of people. She got right in there like she’d been beekeeping her whole life. Hiving both packages went smoothly. Before closing them up we added a gallon of syrup in a hive-top feeder for each of them. They will require a lot of feeding in order to get them to draw out new wax onto the frames. I’ve heard it said that it takes 8 lbs of honey/syrup in order to produce 1 lb of wax. 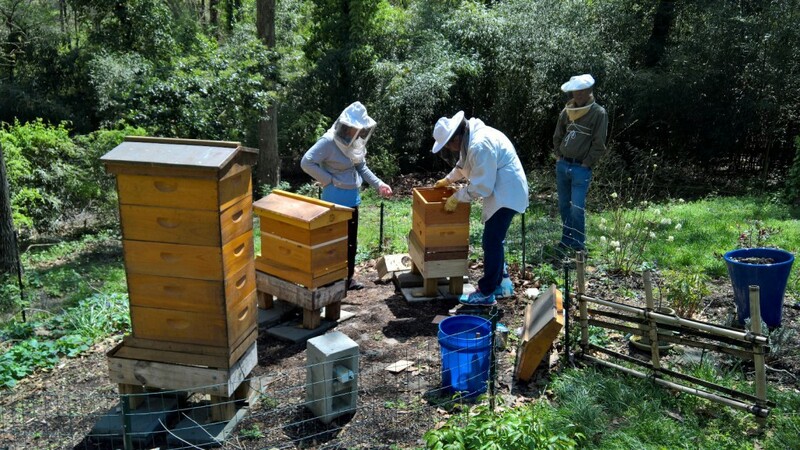 The new hives have to start from scratch, building their combs and filling their pantry with food, including nectar/syrup and pollen. 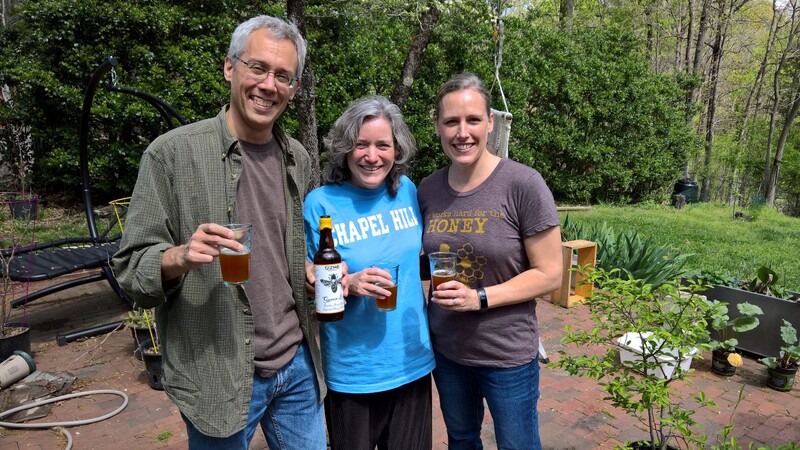 After we finished we enjoyed a celebratory toast with a special beer I had been saving, “Queen Bee Imperial Wheat” by local Gizmo Brew Works. Success! Thanks guys, for being a part of it! 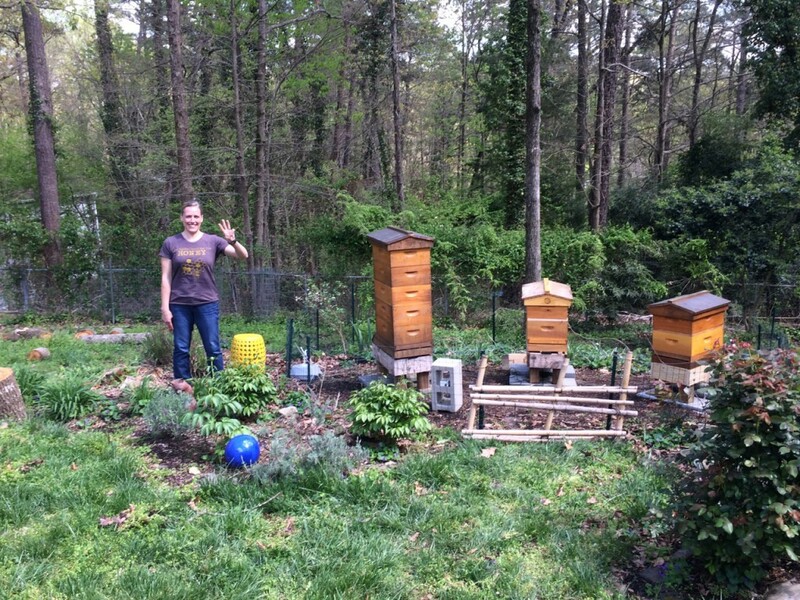 And finally, a picture of the apiary…from left to right we have Queen Charlotte in the high rise, Queen Beelee in the middle, and Queen Latifah. 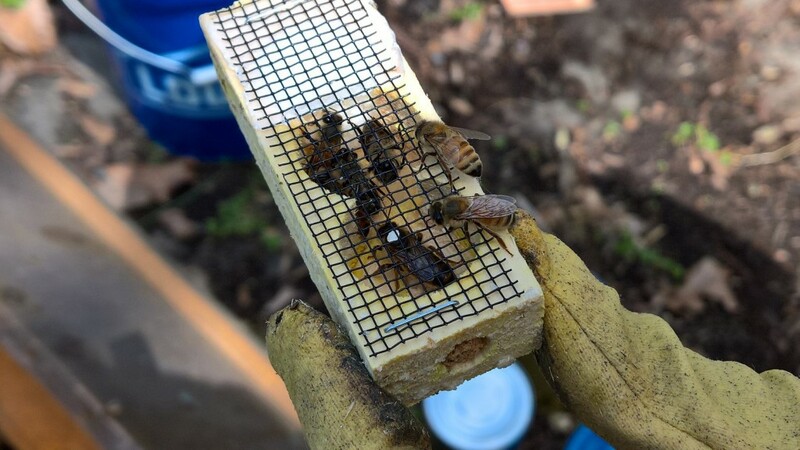 UPDATE: Day 2 after hiving I observed pollen being brought into the new hives, so they must be happy with their new accommodations! It was a great day, thank you so much for letting us “help”. I’m fairly confident bees have a cytoskeleton, but tight junctions? ?